The JET® TJ Transmission Service Jack is available in a 1 ton capacity. 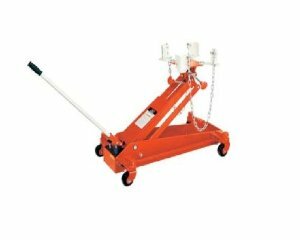 The JET TJ Transmission Service Jack features an automatic safety overload bypass system preventing the lifting of a load past its maximum capacity. The 360 degree ball bearing rear casters that are positioned for best load distribution and optimal maneuvering. JET TJ Transmission Service Jack complies with ANSI/ASME PALD-10 standards.